Click here to view abbreviated endorsements on the publisher's web site. "Anyone with an interest in nineteenth-century evangelicals and their legacies to us should read this carefully crafted book. James Brainerd Taylor was a tremendously influential Christian hero in his day, but has been virtually forgotten since the late nineteenth century. As Francis Kyle makes clear, our amnesia regarding Taylor and the world in which he lived has impoverished our understanding of nineteenth-century religious history, as well as the practice of evangelical Christianity today." "An Uncommon Christian is the story of James Brainerd Taylor, who in his single-minded devotion to God and his kingdom has been compared to his cousin David Brainerd, to Henry Martyn, and to Robert Murray M'Cheyne. Those three are still well known, but Taylor has been largely forgotten. Like Brainerd, Martyn, and M'Cheyne, Taylor died early-just shy of 28, and just five months after he was licensed to preach. He described himself as a 'Bible, everyday' Christian. Those who knew him best saw him as 'an uncommon Christian,' as indeed he was. Francis Kyle carefully sets forth the life and influence of James Brainerd Taylor and along the way provides the reader with interesting and competent descriptions of contemporary institutions, churches, and theological and intellectual movements. The book's thirty-eight pictures are an added treasure of eighteenth- and nineteenth-century American church history." "Some of the brightest lights in the church have been obscured by the forgetfulness of succeeding generations. Those interested in the history of revival will now rejoice over Francis Kyle's recovery of one of the great evangelists of the Second Great Awakening, James Brainerd Taylor. Kyle effectively shows that Taylor's life, while but a flash, burned hot and bright for the cause of Christ; a light we are called to emulate." "Scholarly writing that speaks to both the mind and the heart. It is a significant addition to the literature on early American revivalism." "Francis Kyle's biography of James Brainerd Taylor is an important book for several reasons. First, it is an important contribution to our knowledge of an important but overlooked early nineteenth-century evangelist. Second, Kyle writes this biography in a way that will edify and encourage anyone who seeks to spread the Gospel." "Most of us who look at the stars in Christian history occasionally find a new one in the galaxy. With me, this has been the case with J. B. Taylor. As a student of the First and Second Great Awakenings for some forty years, I am glad to say that the author has uncovered a new Christian hero for me. With meticulous scholarship, Francis Kyle makes James Brainerd Taylor come alive and hopefully take his well-deserved place among evangelists of the early nineteenth century. This book will be a blessing to any reader." "James Brainerd Taylor had as one of his mottos, 'Up and be doing.' In his brief but significant ministry, he passionately exemplified that motto. David Livingstone, noted missionary to Africa, was inspired by Taylor's life—you will be inspired and challenged by Francis Kyle's well researched and finely written account of Taylor's life and ministry. I heartily commend this work." "Every generation can isolate itself from the lessons found in history. An Uncommon Christian confronts us with the heartfelt passion of a focused evangelist. I. Francis Kyle III presents a needed, timely, and scholarly new view of the life and spirituality of James Brainerd Taylor. I highly recommend this work for careful and prayerful reading." "A life cut short, but still one that burned bright with evangelistic zeal! Taylor was, as Kyle puts it, 'a man acutely aware of time and of the need to redeem it for the purpose of advancing the kingdom of God.' And it was his prayer that we become 'uncommon Christians' by which he meant, 'eminently holy, self-denying, cross-bearing, Bible, everyday Christians.' May we all be such! And may this work stimulate us to an uncommon, or excellent, Christianity, which is self-denying and centered on God." "History and biography make the best devotional reading! As a pastor in New York City, which experienced the nineteen-century Fulton Street revival, I was greatly encouraged by the life and witness of J. B. Taylor. His heart for God and passion for holiness, prayer, and Scripture will also fuel your hunger for God's power and glory. Francis Kyle has written a moving and powerful account of Taylor's short but influential life, and I recommend it highly to all who long for the next revival." "Having worked in university ministry for over two decades I have persistently sought to inspire Christian students with examples of how consecration and calling might find expression during the college years. In this, I have often instanced J. B. Taylor but lamented the limited availability of accounts of his life. May the circulation of Kyle's study kindle afresh not only an interest in Taylor but that 'uncommon' faith and fervency which is so honoring to Christ and so needed in our day." "In a time when many seem content to live a complacent Christian life, the story of James Brainerd Taylor is a challenging and encouraging example from the past of a young man who sought to live an uncommon life for the cause of Christ. May the Lord raise up many more like him from this generation of university students." William (Bill) C. Boyce, Jr.
"Francis Kyle has recovered the forgotten, but profoundly influential life, ministry and impact of J. B. Taylor on American society. Within the complex theological context of early 19th-century American Protestant evangelicalism, Taylor shines as a devout, biblical- and revival-minded follower of Jesus Christ. Kyle's detailed descriptions of his piety and humility as well as the impact this young man had in America created in me a fresh yearning for the presence of God. I highly recommend this work to anyone who wants to be inspired by a godly example or who desires to understand the spiritual history of America." "An encouragement that God gives light to every generation and sometimes in the form of radiant believers like J. B. Taylor, a firebrand whom Francis Kyle presents to us in these pages." "Francis Kyle's study of James Brainerd Taylor gives a powerful picture of the past, and an equally powerful challenge to the present. It is a classic example of high quality Christian biography, both accurately based on the past, and illuminating for the present. To quote Taylor, 'We need more "uncommon Christians;" that is, eminently holy, self-denying, cross-bearing, Bible, everyday Christians.'" "I commend this careful study of James Brainerd Taylor, one of the outstanding figures of the American Second Great Awakening. Francis Kyle has told the story of Taylor's remarkable, short life in an accessible manner. He has also probed very helpfully the way in which Taylor's spiritual experience made a crucial contribution to his ministry." "This is a fascinating portrait of a man who was indeed 'an uncommon Christian.' It will provide engrossing reading for all students of nineteenth-century America, historic Calvinism, missiology and, above all, Christian discipleship." "Francis Schaeffer used to say 'there are no little people' in God's family. Francis Kyle's excellent, indeed impressive, study of James Brainerd Taylor is a timely reminder of this abiding truth. When James Brainerd Taylor died in 1829, aged twenty-seven, before completing his formal training for the ministry, he had already touched hundreds of lives with the gospel. Beyond his direct labors, the record of his life and witness profoundly influenced two generations of Christians, among them the notable missionary David Livingstone. We are indebted to Mr. Kyle for re-introducing us to this almost forgotten saint from America's 'Second Awakening,' whose brief life was truly 'a burning and a shining light' for Christ." "The name of James Brainerd Taylor deserves to be much better known, especially amongst college and seminary students. His total commitment to yielding himself to the purposes of God resulted in extraordinary fruitfulness from his evangelistic labors. Oh, that God would raise up many more James Brainerd Taylors!" "Thank you, Francis Kyle, for introducing the life and ministry of James Brainerd Taylor to the 21st century. ATS first published a memoir on Taylor's life in 1833. Over the years, thousands of Christians were impacted by the story of his all-too-brief evangelistic ministry. ATS is now pleased to endorse the reading of Kyle's 'memoir' to Christians in the 21st century." 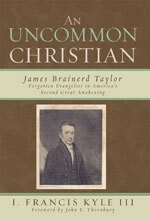 "An Uncommon Christian—Francis Kyle's examination of the life and influence of James Brainerd Taylor—rescues from the ranks of half-scanned footnotes and the rarely-perused pages of academic bibliographies a genuine 'Christian hero' who inspired so many of his nineteenth-century American contemporaries. Any attempt to gain an understanding of the depth of 'lived evangelicalism' in the early-to-mid nineteenth century will be enriched by this recovering of Taylor's role as an inspirational beacon of piety and fervor." "Until Francis Kyle's research prompted me to take a closer look at James Brainerd Taylor, the only thing I knew about Taylor was that Charles Finney often named him as an example of someone who had achieved perfect sanctification during his earthly life. It turns out Taylor himself would have strongly disagreed with such an assessment of his life, and he made that clear. Asked what inscription he wanted to have written on his tombstone, Taylor answered: 'A sinner, born again; a sinner, washed . . . I am nothing; Jesus is ALL.' As a redeemed sinner, Taylor did become a man of exemplary character—humble, joyful, godly, and gracious. Unlike Finney and the perfectionists of that era, however, Taylor was convinced that true holiness is a work of divine grace, not human willpower. 'Surely I am a miracle of grace,' he wrote. 'A sinner saved by grace, free grace, sovereign grace, almighty grace. I feel that I love the Lord, because he first loved me.' Francis Kyle has done us all a great favor by recovering the life of Taylor from relative obscurity. You're going to be challenged, uplifted, and encouraged by this wonderful study of the brief but enduring ministry of a truly uncommon Christian."